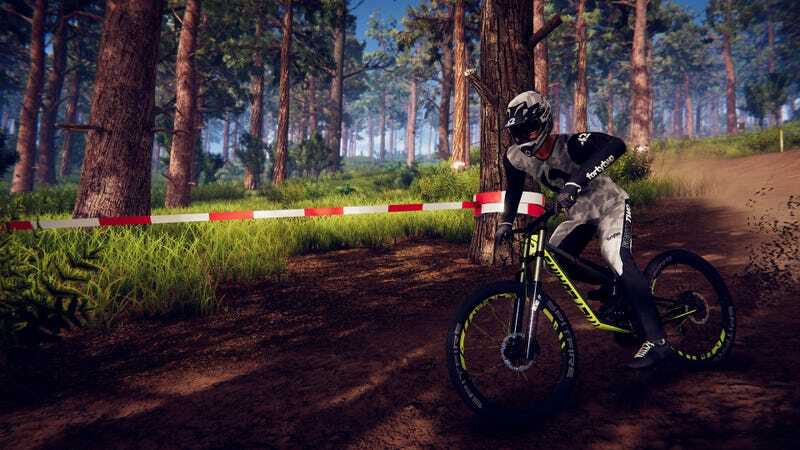 Descenders is a game about riding a bike. It’s also the closest I’ve come to playing a Tony Hawk game since, well, there were good Tony Hawk games to play. I mention a skateboarding game in this post about a bike game because, while these games have their differences—the number of wheels, the verticality of the stages, the emphasis on tricks—they both push the same emotional buttons. Descenders reminds me of Tony Hawk because it’s a game about failing repeatedly in the pursuit of perfection. Every time you play it the basic goal is the same: start at the top of a hill/mountain, and ride down to the bottom, sometimes being fast, sometimes doing loads of tricks, sometimes trying to do both of those things at once. That’s a lot harder than it sounds, especially since your runs are accompanied by bonus objectives. With slippery physics and breakneck speed, you will crash a lot in Descenders. You’ll smack into trees, fall off bridges, crash out on trying to land a trick off a jump. Instead of causing frustration, these spills are just part of the process. You’re supposed to crash, because that’s what happens before you dust yourself off, try again and do better next time. It’s an infinite loop of despair and elation, made fun here by the fact these bikes are a blast to ride, and the sensation of speed and danger as you hurtle down a hillside is fantastic. First-person mode was enough to make me sick. Where Descenders starts to diverge from the fundamental drive of Tony Hawk, though, is where it also gets interesting. Your bike’s physics and controls are the only things you can master here, because with procedurally-generated courses it’s impossible to learn and practice a track layout. So the key to getting better at Descenders isn’t endlessly repeating the exact same trick in the exact same spot every time, it’s about getting to know how your bike responds to overall situations, and which type of stunts are right for the time. It also encourages practice with one hand, while punishing it with the other. You progress through Descenders via a reputation system, with points earned for tricks and competing objectives. You lose points, however, for crashing out. This means your progression through the game’s reputation tiers is never straightforward; you may gradually improve over time, but I’ve spent nights breaking through to a new class, only to drop straight back down after a couple of nightmare runs. Another cool thing that sets Descenders apart from other games of this type (like...Dave Mirra BMX?) is the presence of “bosses”, enormous stunt jumps that take place at the end of a long run. These are tricky to land at the best of times, doubly so when the game decides to add bonus objectives atop them like performing a certain trick while you’re already vaulting a mountain bike over a moving train. It’s important to note that this is in no way an accurate representation of mountain biking. The goal here is to move really fast and pull off some stunts, not recreate the feel of an actual bike, so if you were after something like a simulation, Descenders won’t hit that spot. What it does hit, though, is that almost-forgotten feeling of spending hours trying to nail a trick or clear a course, each crash bringing frustration, but also that urge to fight past it and get the job done.